I discovered Ruby on Rails last year and I used it for creating a webpage for my final degree project. I was so fascinated with RoR than I decided to start learning it. Fortunately I discovered the Ruby on Rails tutorial, that helped me to became a new user of the world of Rails. Now, I am waiting for my print copy of the new edition of the tutorial covering Rails5, that has run out of copies in amazon. As always, Michael Hartl gives a solid and interesting introduction to Rails 5. Please note though, that this book provides a solid basis for developing, and will be a oft dog eared reference for years to come. It'll take you step by step showing all you need to know to start developing your own Rails application. Well structured, organised tutorial with well thought out examples. If you want to learn Ruby on Rails, this is a great start! Excellent source for getting started with rails and really understanding how things work. Michael has an easy to follow style to follow with clear examples and lots of code. Ever since the first version, Michael Hartl's Ruby on Rails Tutorial has been the book I give people who want to learn web app development. This version brings a lot of great new content specific to Rails 5. Whether you're just getting started, or want to go from "eh" to "ah! ", this is the way to do it. Good quality recordings. In-depth explanations and step by step guide on everything of making a real Rails app. The Ruby on Rails Tutorial is the best way to learn web development with Rails. Michael not only teaches you about Ruby on Rails he also teaches best practices in web development. I cannot recommend it enough to anyone who is serious about programming RoR. Very accessible and engaging introduction to Ruby on Rails. As someone who knew a bit of HTML and CSS from running a WordPress site, there's quite a learning curve but I've learned so much about web development by working through it. Easy to follow and builds up your confidence progressively - highly recommended! The Ruby on Rails Tutorial does such a good job explaining and teaching Rails. The author goes way beyond just Rails though, you'll also learn a lot about best practices in web development and programing in general. It's very definitive guide for learning RoR. There are a lot of Rails tutorials around, and I have only come across a couple -- but the Hartl stuff is definitely in a tier of its own. Especially if you invest in the screencasts, things just start to snap into place if you're a novice at this. This is the best resource I have found for learning Rails. I am half way through the material and believe it really helps you learn a lot of the building blocks toward creating a well designed Rails app. You will move through the book faster if you do subscribe to the Learn Enough Society which allows you to view videos of Michael demonstrating each lesson. I think it is well worth the $29 for a month membership if you can devote the time to it. Without doubt, the Ruby on Rails Tutorial is the best resource available (on the web or hard copy) to get novice developers like myself up and coding professional grade web apps quickly. The tutorial not only teaches you how to build a web app using the popular Ruby on Rails framework but also provides many insights into web development best practices. I have read earlier versions and the Rails 5 version does not disappoint. This is a must read. He has some good step by step from start to finish on how to get started on Developing on the fastest web framework. He gives a detailed description on what is needed before you can progress to the next steps. Software Novice Entrepreneur - Must Read! As an Entreprenuer of a recently shuttered startup I kick myself for not learning how to code and getting to a minimal vialbe product before I started pulling money out of my own pocket to do the real development. I could have saved a fortune, got much quicker customer feedback and pivoted faster to what I learned the market place was looking for. Unfortunately I took too long to get to that place and ran out of money. Round Two - Serial Entrepreneur! I was committed not to make the same mistake twice. I found and tried multiple online training forums that had some decent information but they did not connect development to the real world of development, testing, and hosting online. Michael takes all the mystery out the end-2-end process from linux command line, git, remote git, containers and promoting to a public website. I don't ever expect to be a full time developer but I can sure as hell build enough to test in the market, get feedback from the crowd and do all of that for the small investment in this book and the online course. 5 Stars... Thanks Michael for teaching this dog the tricks necessary to get to an MVP!!! 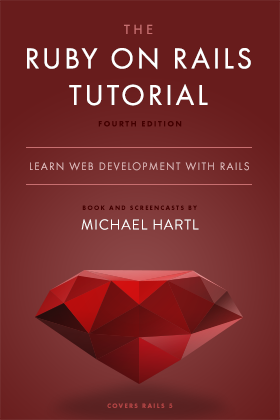 Michael Hartl's Ruby on Rails Tutorial is a very useful book! It is very well structured, starting from a great introduction to installing Ruby, making a very small app and then deploying it, passing through more complex notions and finishing with a good working app and a lot of new knowledge. I am a QA and the book has been very helpful to me to broaden my horizons in software engineering. It's the best programming course I've ever seen (and I've seen many). I'm actually doing all your other tutorials just for fun, and to check if I can fill some gaps in my knowledge. It's been really useful, thanks!